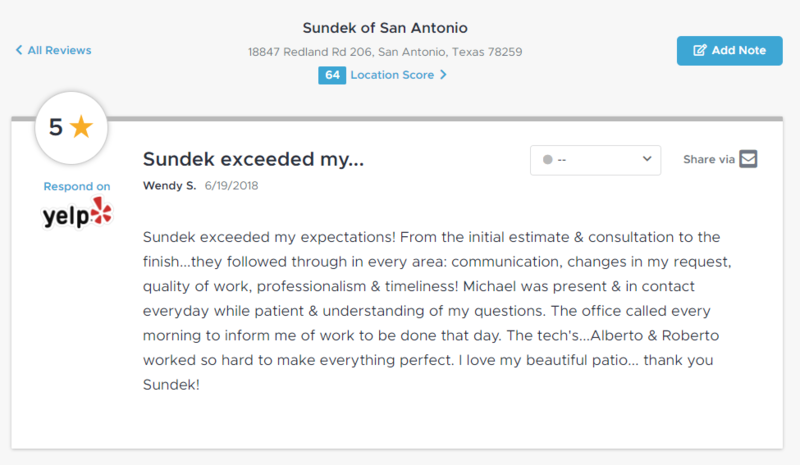 We thank each and every one of your clients who have taken the time to express your opinions and experience with Sundek of San Antonio. We always strive for 100% customer satisfaction and learn from less than 5 star reviews. If you would like to submit a review please send it to us at lsnider@sundek.com – Thank you. We are repeat customers and are thrilled with the great job the Sundek crew did in refinishing our 1100+ sf deck. From initial contact to final approval, every Sundek employee was courteous, knowledgeable, and responsive. They communicated with us frequently during a weather delay, and adjusted to meet our schedule requests. Alberto and Sergio are true craftsmen and did outstanding work in this large job, to include repairing and camouflaging existing cracks and low areas. They carefully covered our pool and all existing structures and adjoining stone areas. The scoring was a great addition. It looks fantastic, adds detail to the large area, and will help with drainage. They also took extra care in refilling the existing joints and addressing all of our concerns. We are very pleased with the results! in 11 days. And it is fantastic. The installers were on time, worked hard, were diligent with details, kept everything spotless and did a great job. Tony came by and Craig was there a lot. The office personnel were very responsive and professional. The finished product is amazing and exactly what we wanted. We absolutely recommend Sundek to anyone wanting to create something special. They were not afraid of our complicated design and we recommend them highly! We couldn’t be happier with our refinished patio from SunDek! We had a one man show screw us over and it turned out absolutely terrible! SunDek came in for a reasonable cost and completely changed the look! Our backyard is going to be our new favorite place! Very happy with experience. They were on time and efficient. We have used Sundek twice in the last year and the workmanship was excellent. From scheduling to work completion all went smoothly. My only complaint would be that he touch up paint they gave us does not match what was done on the deck. We had areas pop through that looked like rust about 3 weeks after job completion and we used the touch up paint and it’s not an exact match so those areas really stand out now. Pleased with service; would recommend them to any potential clients. Sundek of San Antonio did the walkway to my front door, my back patio and the extension of my patio. If you are tired of looking at that concrete, they come in and show you a variety of things they could do. The people that did the actual work, the two gentlemen, one had been with the company for 25 years and is a master at what I had done, which was called scrolling–a texture to make it look like stone. He just did it free hand and was just very good. The price they charged was comparable to the going rate, but they aren’t the cheapest service out there for this type of product they produce. There are certain times you can get someone else cheaper, but you may pay for it in the long run. I referred three customers to them who wanted some treatments done. Two of their new clients came to look at my finished product and were very pleased. Their brochure was loaned to the third person who liked what she saw and contacted one of their representatives. Sundek is worth looking into and I wish they would expand their territory a little out of state, because I think they would have a very good market. Professional and Reasonable. Was very impressed with the professionalism of the employees and the reasonable cost. Placed a cap of concrete onto our old slab with a nice texture and color and it looks great! Sundek of San Antonio was pretty awesome. The flooring they installed looks great. They did the whole first floor for our first and second building. It’s a lot easier to clean and not as slippery for residents when it rains. The guys were really friendly and they did an outstanding job. We had Sundek extend our decking surface to a preexisting patio. The price was fair and the work was promptly done. No complaints here. Great job. 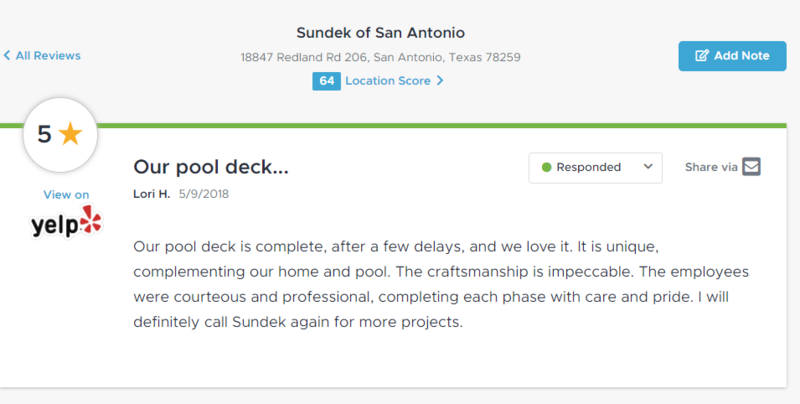 We are so happy with the work that Sundek did on our cool deck around our pool. The employees were very polite and made sure everything was done correctly and that we were happy. OUTSTANDING SERVICE AND SUPERIOR RESULTS! !